With the start of college basketball season on the horizon, we’ll be taking a long look at the conference at large as well as Indiana’s roster over the next month. Today, we finish our look at the Big Ten with the Maryland Terrapins. After a surprising 28-7 season and a trip to the round of 32 in the NCAA tournament, Maryland enters the 2015-2016 season with a set of high expectations. Cruise the college basketball preview magazines and you’ll find the Terps no lower than No. 4. 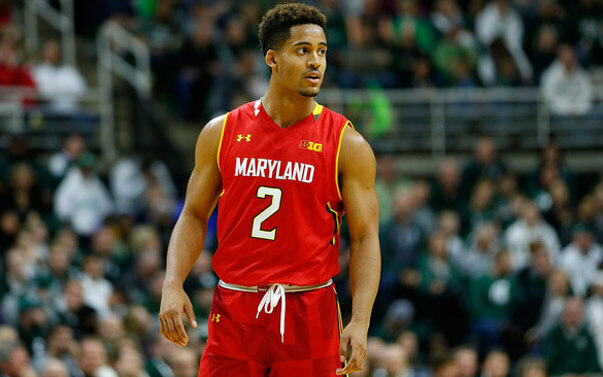 Sophomore guard Melo Trimble is being talked about as a potential All-American. The program also welcomes five-star big man Diamond Stone and returns several key pieces from a season ago. It’s been a complete reversal of fortune for Mark Turgeon, who was near the top of every coaching hot seat list a year ago. Winning and recruiting at a high level can turn things around quickly and Turgeon did enough of those things over the last 12 months to have his program positioned favorably for the foreseeable future. The catalyst in the turnaround isn’t singular, but when seeking to explain it, start with Trimble. Turgeon put his trust in him last season and was rewarded in a major way. Maryland was the country’s second luckiest team last season according to KenPom.com’s luck stat, but Trimble also deserves credit for his ability to run a team. As a freshman, he was ridiculously efficient at getting to the foul line as his free throw rate percentage (FTA/FGA) of 71 exemplifies. Trimble also hit over 40 percent of his 3s. The combination of being able to hit the jumper and also get into the lane with the purpose of drawing fouls is a scary combination for Big Ten defenders. Trimble will be without Dez Wells alongside him in the backcourt, but the program has four other pieces who should all make an impact. Start with sophomores Jared Nickens and Dion Wiley, who both should see their roles increase in year two. Nickens is unique because he’s 6-foot-7, which allows him to guard multiple positions. He’s also close to a 40 percent 3-point shooter. Wiley struggled with his efficiency last season, but is another capable shooter. The wildcard is Rasheed Suliamon, who transferred from Duke after being dismissed from the program last season. The former McDonald’s All-American will have to blend in with an already talented roster, but it’s his last chance to do so. Junior college transfer Jaylen Brantley will serve as Trimble’s backup. The frontcourt for Maryland should be equally impressive as Jake Layman figures to slide back to the three. At 6-foot-9, he’s a very good inside/out threat who hit 37.8 percent of his 3s and also took 141 free throws, which was second on the team. The addition of Stone, a 6-foot-11 Wisconsin native, gives the Terps a legitimate post presence with superb footwork. That was missing on last year’s roster as guys like Michal Cekovsky and Damonte Dodd struggled with fouls and consistency. Joining Stone down low will be Georgia Tech transfer Robert Carter, who averaged 11.4 points and 8.4 rebounds during the 2013-2014 season with the Yellow Jackets. Bottom Line: Is Maryland the best team in the Big Ten? On paper the Terps certainly are. However, don’t expect this to be the walk in the park Wisconsin had last season in the league. Maryland has an incredibly difficult conference schedule and it’ll be a different vibe for many of the players playing with expectations versus playing with none a season ago. The pieces are here for a Final Four run if the new additions mesh well and Stone is able to dominate the paint like many believe he will. Quotable: “This is why I took the Maryland job — to have a team like this. I knew last year at this time that we were going to be good, but I didn’t know that we’d win 28 games. I’m really excited about coaching this team and seeing what I can get out of them and pushing their buttons. That’s why we do it. I don’t know what our rotation is going to be, but that’s what I get paid to do. I love that part of it. When I’m out there in between the lines, it’s a lot of fun and there’s nothing better. I’m excited about it. It’s going to be a really fun year.” – Turgeon to CBSSports.com in July. I think Indiana and MSU can beat them on the right night for sure. They almost have exactly what you want in a team. A great PG, a big man, shooters, a pock down defender, size and length, and experience. Now we’ll see if they can put it all together for a great season. I agree with the most recent podcast. Maryland, on paper anyways, is in the upper tier. I don’t think they will dominate this season, but I don’t think any team in college basketball will. They are definitely beatable, and I’ll even go on record and say that may have 1 or 2 bad losses this year. Similar to IU (and most everyone else in the Top 15), they are one of those teams I could see getting hot and making it to the Final 4….or getting put out in the Sweet 16. I really don’t think they have the most talented player at any given position (except for Layman at the 3). They are just really well rounded. They resemble us in that any guy 1-5 can do some damage. Our game with them basically comes down to coaching and defense. Our last game of the B1G regular season. Both teams will be well seasoned by then, and well scouted. The kicker might just be that the game is at Assembly Hall. That is going to be a good game! I’m leaning to IU because of the “you rank’em, we spank’em” mantra (thanks SCHoosier!). Second luckiest team in the NCAA last year … per Kenpom. This year it might be a different story. This should be a really good year for the B1G, and CBB all over. Lot of parity. It’s better to be lucky than not. Right? I hope we will lose the games we’re supposed to lose and win the games we’re supposed to win, for a change! Yes it is. Sometimes it’s better to be lucky than good. LOL … In college BB the parity is getting pretty decent because of a myriad of reasons, skill levels being one point. So adding a little luck to a skilled team is what gets you through a few extra games. IMO, anything after the sweet 16 depends to some degree (after skill) on a little luck, a good bracket, and a good draw. Wow I didn’t realize how big they were…a 6’7″ guard (Nickens), a 6’9″ wing (Layman), and Stone and Carter in the front court? Maryland’s depth is the reason why they’re so good. They are big. And Sulaimon is about 6-4 or 6-5. Ya I knew that one was coming… you’re right its a scary thought.